This new paper describes how filters can distort the timing/phase of neurophysiological signals, including LFPs, ECoG, MEG, and EEG/ERPs. See also the following papers (written with boot camp alumns Darren Tanner and Kara Morgan-Short), which show how improper filtering can create artificial effects (e.g., making a P600 look like an N400). Tanner, D., Morgan-Short, K., & Luck, S. J. (2015). How inappropriate high-pass filters can produce artifactual effects and incorrect conclusions in ERP studies of language and cognition. Psychophysiology, 52, 997-1009. Tanner, D., Norton, J. J., Morgan-Short, K., & Luck, S. J. (2016). 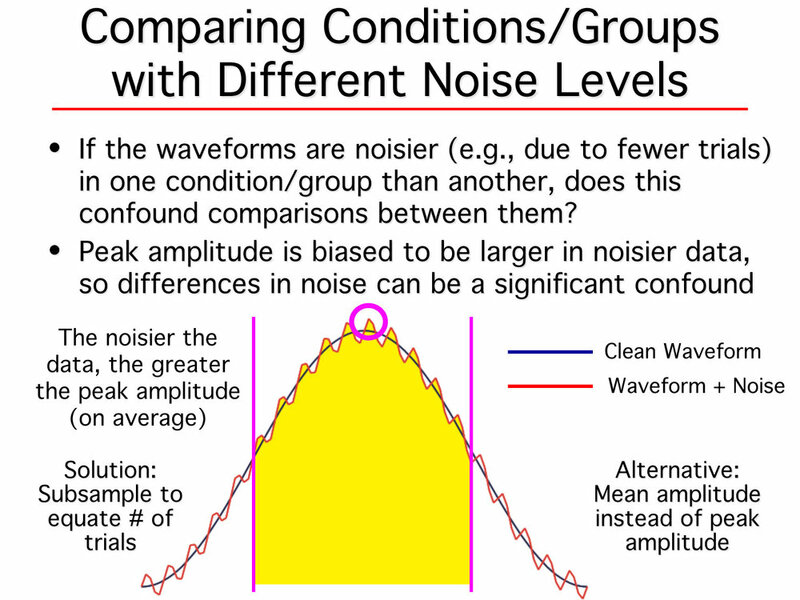 On high-pass filter artifacts (they’re real) and baseline correction (it's a good idea) in ERP/ERMF analysis. Journal of Neuroscience Methods, 266, 166–170. Bottom line: Filters are a form of controlled distortion that must be used carefully. The more heavily you filter, the more you are distorting the temporal information in your signal. Bae, G. Y., & Luck, S. J. (2018). Dissociable Decoding of Working Memory and Spatial Attention from EEG Oscillations and Sustained Potentials. The Journal of Neuroscience, 38, 409-422. You've probably seen MVPA and other decoding methods in fMRI, but did you know that it's possible to decode information from the scalp distribution of EEG/ERP signals? In this recent paper, we show that it is possible to decode the exact orientation of a stimulus as it is being held in working memory from sustained (CDA-like) ERPs. A key finding is that we could decode both the orientation and the location of the attended stimulus with these sustained ERPs, whereas alpha-band EEG signals contained information only about the location. Our decoding accuracy was only about 50% above the chance level, but it's still pretty amazing that such precise information can be decoded from brain activity that we're recording from electrodes on the scalp! Stay tuned for more cool EEG/ERP decoding results — we will be submitting a couple more studies in the near future.